Happy ‘Stretch’ Tuesday – Cal here….time for a stretch to get out those kinks we got from being back to work on Monday! I’m going to share some of my recent finds tonight. It turns out that I have acquired quite an assortment of stretch glass recently and I thought it you might enjoy hearing about and seeing some of it. From John and Ann Fenton I got 4 red punch cups. You may recall us previously discussing stretch glass punch cups on here. 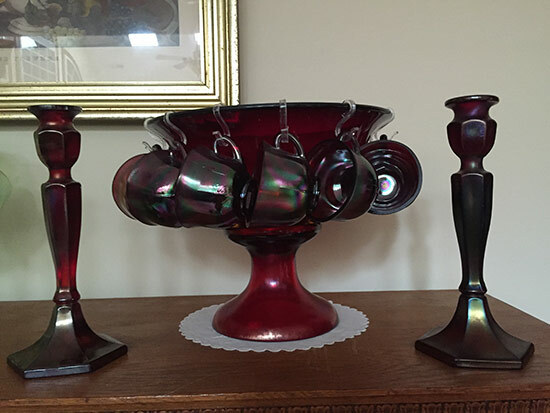 Since very few of the old red (Ruby) punch cups are known, stretch collectors for many years had red punch bowls but no punch cups to go with them. A couple years ago the SGS worked with John & Ann to make some red stretch punch cups in a mould they borrowed from Fenton. It wasn’t the mould for the vintage punch cup, but it was a Fenton punch cup mould. There were some challenges getting the cups to be red rather than Amberina, so the cups from the first batch were mostly Amberina in color. 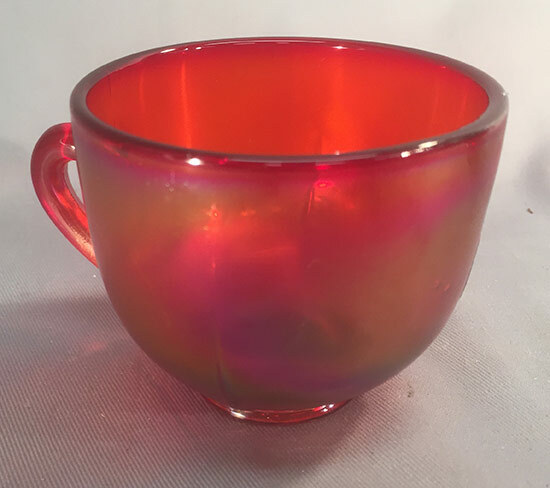 They made several batches of these cups and in some batches they achieved a wonderful deep red color and good iridescence. 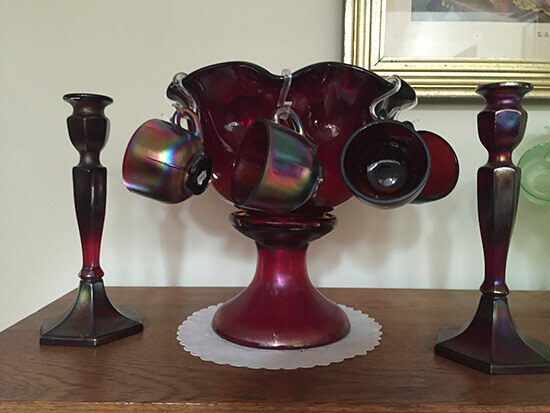 However, they ground the top rim of these darker red punch cups (pretty much a no-no for stretch glass collectors). I got past the ground tops and have a couple sets of them which I love. 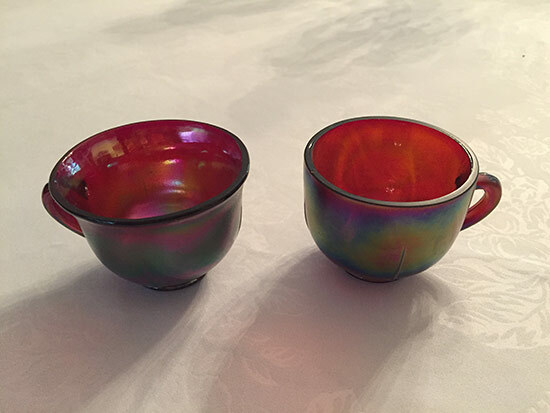 They work well with my vintage punch bowls and I am thrilled to have. I am even more excited to now have 4 red punch cups with the moulded top rim (not ground). I’m not sure why John recently listed them on eBay, maybe he had these tucked away at the shop and decided to do some cleaning. At any rate, thanks, John! I love the cups. From another eBay’er came a purple bowl. It was listed as an Imperial bowl, but I knew from the photos that it was anything but Imperial. My suspicions were correct and it turned out to be a Vineland bowl. It has great color, form and iridescence. And it has the tell-tale ‘chip’ marks in the base. 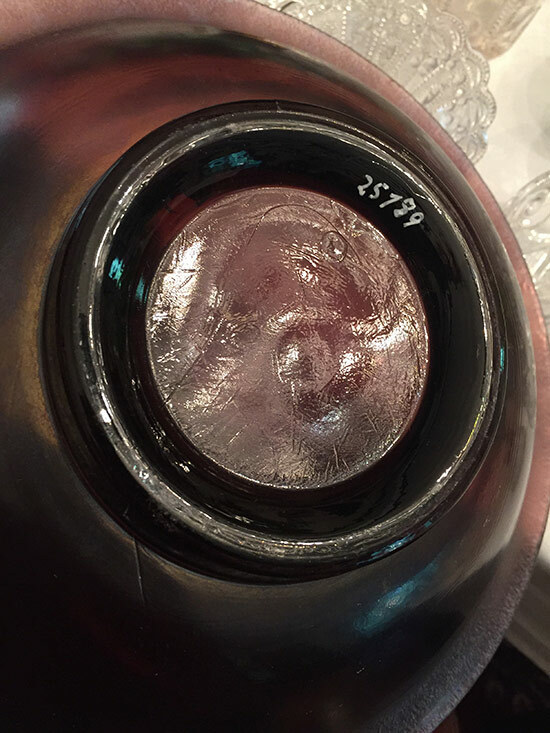 It seems that Vineland was not too kind to their moulds when they were removing excess glass, especially in the underside of the base. 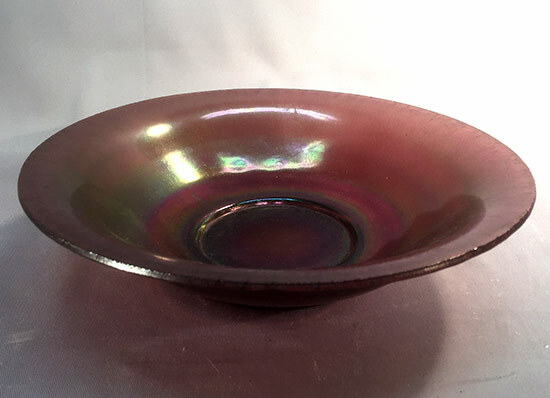 As a result, many of their bowls do not have a nice smooth area in the base as is typical in stretch glass made by other companies, but instead it shows the results of chipping that extra glass out of the mould. If you are trying to distinguish a piece of stretch glass between Vineland and any other company, look for these marks in the base – if they are there, your stretch glass will almost always be Vineland. My third recent buy also came from eBay and it is an interesting marriage of glass. Maybe someone can help me identify that part that is definitely NOT stretch glass. This was advertised as a Northwood Russet Peg Lamp. Well, we all know that Northwood didn’t make stretch glass “Peg Lamps” (or did they????) but I figured it would be a good conversation piece, so I put in a bid and won it. The base is a Northwood Russet candleholder #657 – it is easy enough to find one of these. The ‘peg lamp’, however, is something else. Unlike the Peg Lamps made during the Flint Glass period when folks were first switching from candles to lamps (and didn’t want to throw their candleholders away), the “peg” on this lamp does not appear to have been pressed in the same mould as the font or even to be made of glass. I am guessing it was attached to the lamp font at some point – maybe when the lamp font was made, maybe after whatever the lamp font was attached to was broken. At any rate, there is a peg which fits nicely into the Northwood candleholder. The burner appears to be quite old and the font is probably the same age. The font is nicely decorated with a raised gold painted design and is iridized. If anyone recognizes this font, I’d love to know its origin so I can properly re-name the “Peg Lamp” to include a reference to the font. Despite never feeling like I find enough stretch glass – I’m sure you feel the same way from time to time – I am realizing that I’ve done pretty well in finding stretch glass so far this year. I can count at least 25 pieces of newly acquired stretch glass, which isn’t bad. Speaking of acquiring stretch glass, one of the highlights of the Stretch Glass Society’s Annual Convention, Show & Sale on July 27-29, 2016, at the Quality Inn-Marietta (OH) will be 10-15 tables of stretch glass for sale by SGS members. It is a sight to see and usually gets the adrenaline flowing for all of us as we anxiously await the start of the “Stampede” on Thursday morning, marking the beginning of the buying and selling of stretch glass at our convention (no buying during set-up). If you like stretch glass, please join us. We will have lots of stretch glass on display as well and Tom Burns has an auction on Friday night which is almost certain to include some carnival and other great glass.